Simplee Aloe combined two of the most nourishing ingredients to bring you a tasty drink like no other! Say ‘aloe’ to their blend of Aloe Vera and Coconut water designed to support healthy digestion and keep you nicely hydrated. Simplee Aloe kept it as natural as can be with absolutely no artificial nasties to give you that potent punch of Plant Power! Coconut Water (50%), Aloe Vera (25%), Fruit Extract, Vitamin C, Water. Enjoy chilled & shake before you drink. Once opened, please keep refrigerated and consume within 3 days of opening. Below are reviews of Simplee Aloe Aloe Vera Coconut Water - 1L by bodykind customers. If you have tried this product we'd love to hear what you think so please leave a review. 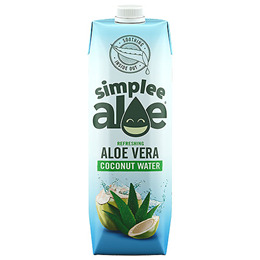 Simplee Aloe combined two of the most nourishing ingredients to bring you a tasty drink like no other!